Menu: Strawberry and Almond Salad with a creamy poppy seed dressing, grilled garlic corn, and grilled portobello’s on homemade potato rosemary bread! So, the real star of this meal was the potato rosemary bread. The recipe came from another food blog, Smitten Kitchen…check out the recipe here. Anyways, the bread was quite a production, but if you have some time and are craving some fresh, hot out of the oven rosemary bread, I highly recommend this recipe. 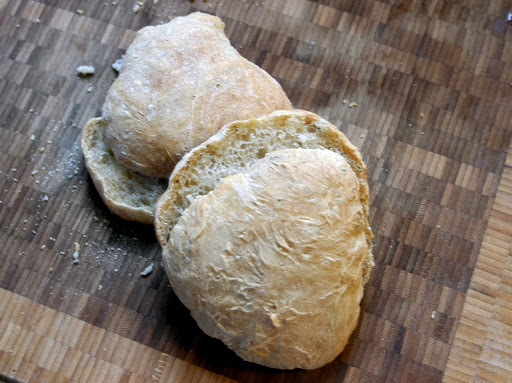 There are few things better than a fresh slice of bread with a smidge of butter that melts instantly…yummmm. 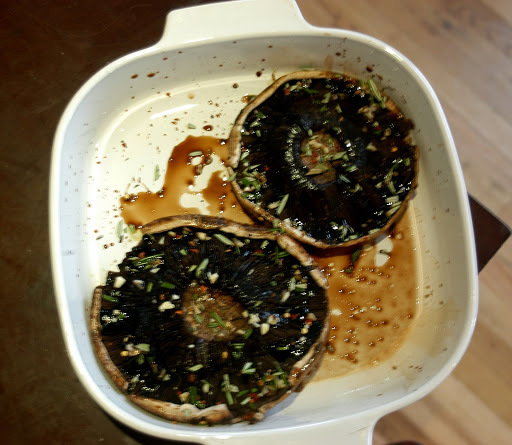 N-E-ways…we realized we haven’t blogged about our staple meal…grilled portobellos. We eat them almost once a week. On buns, without, with mozzarella melted on top, with various aioli’s, or just by themselves. If you haven’t ever had a grilled portobello mushroom, well you are missin’ out. 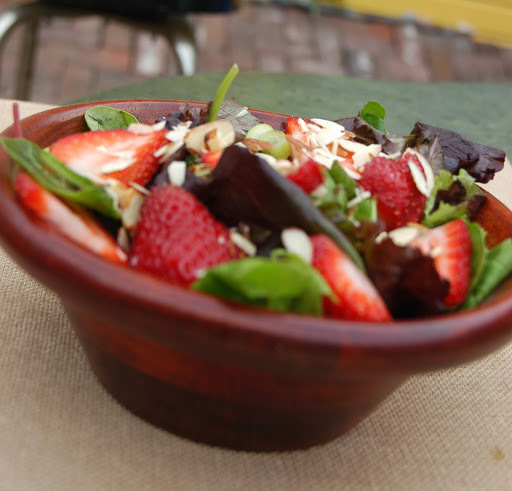 We also whipped up a big strawberry salad, since the strawberries are out in full force. 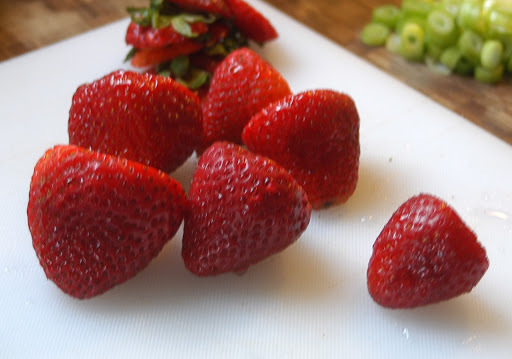 It is usually a necessity for me to have freshly chunked blue cheese on my strawberry salad, but I didn’t have any around. So, I had never made a poppy seed dressing, but whipped up something, which turned out great! It was light, creamy, with a nutty flavor. We topped the salad with sliced almonds and called it a night. I think a lot of times we are pressed to create a big salad full of toppings like we get in restaurants. I’ve found that the best salads we have are on those nights when I have some spinach or lettuce and throw whatever’s in my fridge on top. Here’s the key – pick a theme around one ingredient and then round your food group bases. Got an apple you just have to use? Try pairing it with thick cheddar chunks and pecans. My formula is fruit or veggie, cheese, nuts, and always green onions. Give it a try next time you feel like makin’ a salad. Now, finally, the recipe! 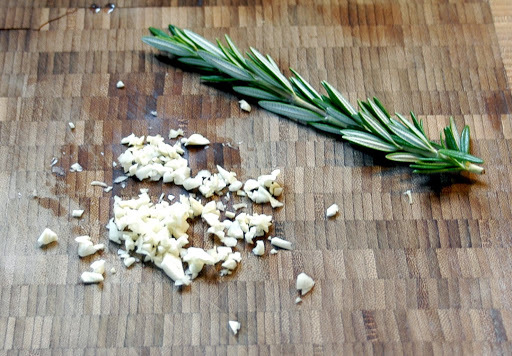 Combine Worcestershire, vinegar, and EVOO in a small bowl. Starting gill side down, rub half of the dry ingredients (garlic, rosemary, thyme, peppers) into mushrooms. Drizzle with about 1/4 of the wet ingredients. Flip mushrooms and sprinkle with remaining dry ingredients and pour the rest of the wet ingredients over mushrooms. Set aside and let marinate at room temperature for about 25 – 30 minutes (can be as little at 15 and as much as an hour, I have found that this range works best). 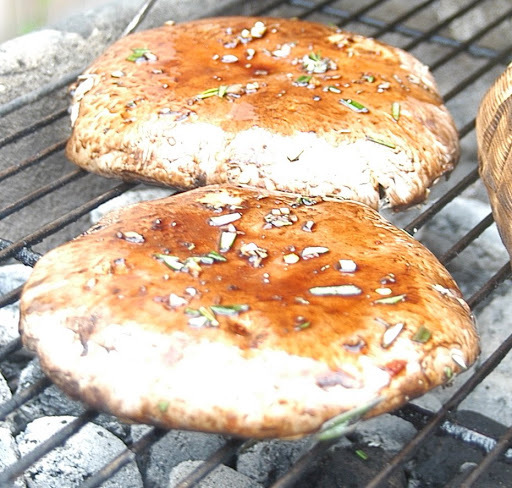 Remove mushrooms from marinade and sprinkle with salt just before grilling. Turn heat down to medium and place mushrooms GILL SIDE DOWN** and grill for about 5 – 6 minutes. Flip mushrooms and grill for another 3 -5 minutes. Add cheese after about a minute or so. Close grill while mushrooms cook for best flavor. Serve ’em plain or on a bun, but please enjoy! *Some say to remove the gills inside the mushroom cap. I have done this once or twice and find that it’s messy, a pain, and I think the gills help soak up all the yummy marinade. **Everytime we grill mushrooms in our household, wepromptly yell, “gill side down first!” Why? Good question. When mushrooms cook, they begin to lose their firm shape and release their juices (this is why you salt just before grilling or when sauteeing, salt after the mushrooms brown and release juices…). Think about a mushroom, cap side up on a grill, releasing all it’s juices…into the cap. The juices pool up and when it’s time to flip it over you ruin your fire! So, join us in our routine, and happily yell, “gill side down first!” to help you remember before you cook ’em! This entry was posted in grill, Vegetarian by callywoodfarms. Bookmark the permalink. I'm totally making some of these this weekend … I'll be doing it in the oven, but you can bet I'll still yell “gill side down first!” Ever think about adding some BBQ sauce and making it a burger?